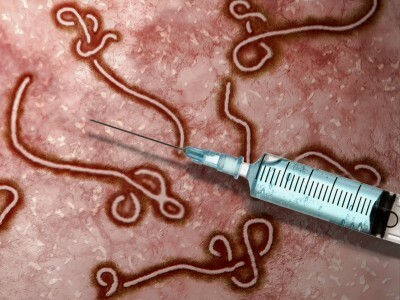 A recent trial of a vaccine to prevent the Ebola Virus Disease (EVD) has taken place in the West African state of Guinea, where the latest and most lethal strain of the Viral Hemorrhagic Fever (VHF) originated in late 2013. Tested on 7,500 people, the vaccine is designed to protect those exposed to the virus as well as others who come into contact with them. The trial study testing the effectiveness of the drug began with frontline health workers on March 7 with the vaccination of Guinean officials. Other frontline personnel have been vaccinated since March 25, beginning with medical workers at the Donka hospital in Conakry, the capital of Guinea. Preliminary findings from the Guinea Phase III efficacy vaccine study shows that VSV-EBOV (Merck, Sharp & Dohme) is effective against Ebola. This body of international researchers – the Data and Safety Monitoring Board – that conducted the experiment advised that the trial should move forward. An article published by the British medical journal, The Lancet, says that the trial suggested 100 percent effectiveness. Based upon the research report published in the Lancet, the vaccine is safe, and also provides the first evidence that unvaccinated people may be indirectly protected from the Ebola Virus disease (EVD) when the VSV-ZEBOV vaccine is provided using what is categorized as a ring vaccination strategy. The latest strain of EVD, one of a number of Viral Hemorrhagic Fevers (VHF), has proven by far to be the most lethal. Reports indicate that the disease was first noticed in the Democratic Republic of Congo (DRC) in 1976. Subsequent epidemics have come and gone sparking concern but not nearly as many deaths. Between 1976 and 2013, it was reported that less than 2,500 people had been infected. Nonetheless, since December 2013, there have been over 26,000 cases resulting in more than 11,000 deaths. The countries most severely impacted in the West Africa region were Guinea-Conakry, Sierra Leone and Liberia. These states are facing formidable development challenges due to the legacy of colonialism and neo-colonialism that left the societies without the necessary healthcare, educational and social services infrastructures as well as trained medical personnel. Liberia and Sierra Leone underwent extended civil wars during the 1990s and early 2000s where millions were displaced causing the fleeing of healthcare professionals and educators. These countries are yet to recover from these tumultuous events. Guinea-Conakry, a former French colony, has been the scene of military coups, mutinies and civil unrest since 1984 with the death of the first President Ahmed Sekou Toure. There were several other states in West Africa where a limited number of cases took place in Nigeria, Senegal and Mali. However, the outbreaks in these countries were rapidly contained. The outbreak reached its peak during the mid-2014 prompting the deployment of thousands of United States troops to the region in these states which were already targeted through the U.S. Africa Command (AFRICOM). Hundreds of Cuban healthcare professionals volunteered for the relief efforts where they were recognized for their professional and selfless dedication to eliminating the disease. Although the vaccine is said to have 100 percent effectiveness among those that were a part of the trial, additional evidence is still needed in regard to its ability to shield large populations through what is known as “herd immunity”. As a result of this the Guinean national regulatory authority and ethics review committee has given the go ahead for additional research. The research methodology utilized in the trial is called a ring approach. Some of those participating in the study are vaccinated for protection soon after an EVD case is diagnosed. Later other participants are vaccinated after a 21 day period. This is a different approach from utilizing a placebo in providing a randomized control group for comparison, nonetheless, simultaneously guaranteeing that all contacts are given the vaccine within the course of the trial. This research design was developed by a group of experts from Canada, France, Guinea, Norway, Switzerland, United Kingdom, United States, and the WHO. The group included Professor Donald A. Henderson of John Hopkins University, who led the WHO smallpox eradication effort by using the ring vaccination approach. The vaccine, which was initially developed by scientists at the Public Health Agency of Canada, contains the Vesicular Stomatitis Virus (VSV), which is thought to cause disease in livestock and not people, with the Ebola surface protein attached. Also the NewLink Genetics USA participated in the development of the vaccine and it is manufactured by Merck Vaccines. This research team included scientists from The University of Bern, the University of Florida, the London School of Hygiene and Tropical Medicine, Public Health England, the European Mobile Laboratories among others. This is one of two vaccines being tested at present in the Ebola-impacted states. There is another vaccine produced by GlaxoSmithKline (GSK). The trial study used the Merck vaccine and was directed by Ana Maria Henao-Restrepo of the WHO. Although this initial trial provides promise for containing and eradicating EVD as a major threat to human health and the overall well-being of the most severely-impacted states, the long term solutions to the crisis must address the necessity of training medical personnel, the building of hospitals and clinics as well as constructing economies in West African countries that serve the interests of the majority of people. Cuban medical personnel which set high standards in the relief efforts illustrates the ability of a socialist society to develop scientists, educators and healthcare workers who operate on a planned basis designed to address the needs of the people. Prioritizing education, research and healthcare prepares a population for natural and man-made disasters.